story by Tenaya DarlingtonIf you’re a fan of Beatrix Potter, then you probably remember Jemima Puddle Duck, a character in many Peter Rabbit stories. If there’s a young reader in your house, this might be the perfect time to introduce this tender morsel of cheese with a pleasing, grassy character. Puddle Duck Creek, a bloomy muffin from Peach Bottom, Pa., is nothing short of adorable. The rind is lacy and quilted, and the paste within looks like banana pudding. A cheese this golden inside can only mean one thing: The milk comes from grass-fed cows. Beta carotene in milk gives cheese a buttery glow. This is a good thing, a sign of pastured animals, which is how ruminants were meant to live and eat. Hillacres Pride in Lancaster County produces Puddle Duck Creek. The Arrowsmiths, a three-generation family, run the farm and provide most of the labor. Their many cheeses are usually made from raw milk, but Puddle Duck is pasteurized, since it’s young (a federal requirement). 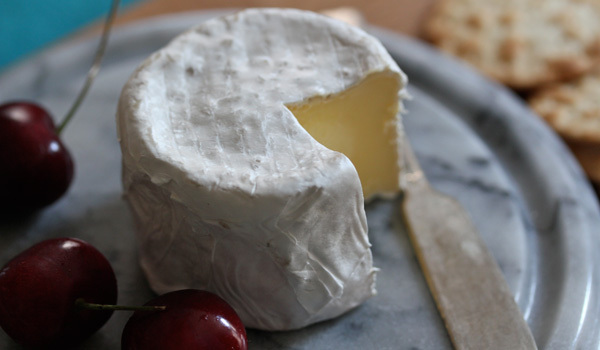 Still, this cheese is flavorful, lactic and herbaceous, with a peppery pop to the rind. Try it on water crackers with fresh fruit or jam.